.BIKE, .CLOTHING, .HOLDINGS, .GURU, .SINGLES, .PLUMBING, .VENTURES - generally available! 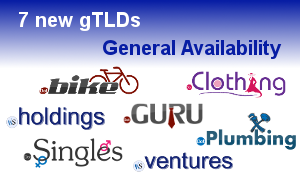 Seven new gTLDs, .BIKE, .CLOTHING, .GURU, .HOLDINGS, .PLUMBING, .SINGLES, and .VENTURES, have entered the General Availability period. They are open for registration to general public on a first come, first served basis. According to the Registry managing the above gTLDs, this marks “the beginning of a new era for the Internet in which users will have unprecedented choice in how they identify and brand themselves online”. Scheduled for kick off on February 5 are .CAMERA, .EQUIPMENT, .ESTATE, .GALLERY, .GRAPHICS, .LIGHTING and .PHOTOGRAPHY. Anyone interested in registering domain names related to those terms will be free to do so. Making the new gTLDs available to general public will provide an exciting opportunity for brands, organisations, businesses and individuals to establish their online identity that is unique to their products, services or interests.